Along with the rest of the country, Nelson and Marlborough were wet in the early spring. However, the subsequent upside of good growth over rode the earlier inconvenience of inclement weather. Spring demand for rural property was strong with plenty of enquiry from outside the region. Two Rai Valley dairy properties, of 303 and 581 hectares, both marketed by the deadline private treaty process in late November and early December, attracted positive buyer interest, while larger Murchison dairy farms are also on the market. Any sales that eventuate will be keenly monitored, and will influence the rest of the season’s market. With relatively few spring sheep and beef listings, Nelson and Marlborough grazing property also attracted positive attention, as a 1200 hectare Seddon hill block demonstrated, going under contract shortly after a $3 million November listing. Two stellar North Canterbury listings attracted considerable interest during the spring. Mt Whitnow Station comprises 4381 hectares of freehold high country bounded by the Seaward and Waitohi Rivers, while 843 hectare Randolph Downs, north of Amberley, has traditionally been a breeding and finishing unit that in recent years has supported an approximately 5,000 head fine wool merino flock. As usual in the region, farms with scale, location and well-documented productivity have attracted good interest. As in other regions, while there is no shortage of dairy farms listed for sale, buyers are taking the time to make careful decisions, evaluating all the relevant factors, such as water charges, nutrient budgets and Overseas Investment Office considerations. An increase in market activity is possible in summer, though it may take a while for price expectations to settle. Local cooperative, Westland Milk Products has forecast a payout between $6.40 and $6.80 this season, putting most West Coast farmers back in profit. While that, plus a fertile growing season and increased productivity, has raised confidence, there was little impact on the spring rural property market. Few farmers are offering property for sale and buyer enquiry is scarce. Repayment of debt is the priority for most of the region’s farmers, who are preparing for a period of consolidation over the next couple of years, therefore the situation is unlikely to change much throughout the summer, with few new listings indicated over the coming months. As always, the West Coast remains an excellent option for first time dairy farm ownership and new owners from other regions this summer would be welcomed in the local market. As in much of the rest of the country, plenty of Mid Canterbury and Geraldine dairy farms are listed for sale, giving buyers options. However, a wet spring and wariness around Mycoplasma bovis have tempered enthusiasm for rural property. One particularly noteworthy listing, Wainono Dairy Farms, near Fairlie, averages 800,000 kilograms of milksolids from more than 1850 cows on a milking platform of 562 hectares. Few properties of this scale have changed hands since 2014 and its sale will help determine the nationwide market for larger properties. Smaller farms are easier to finance and commonly sell to neighbours, such as a 32 hectare Seadown property sold at auction in November for $1.4 million and a 129 hectare Cannington property that changed hands for $2.033 million. When vendors and purchasers see where values are settling, an increase in transactions is likely. Spring left Central Otago dry, though favoured the region’s east coast more generously, turning it into a real picture. In common with most other parts of the country, Otago’s rural property market recorded few spring sales and low overall activity. Despite several excellent dairy property listings, market response was underwhelming. Sheep and beef properties, meanwhile, present a different picture, particularly for listings at the premium end. Although these are few in number, they are well sought after. Hazeldale, in Kaiwera, is known as one of South Otago’s most admired properties. An 1837 hectare freehold hill country station that wintered 10,830 sheep and 775 cattle, it attracted considerable interest when offered for sale in the spring. Marketed by the tender process, with a scheduled deadline in February, progress towards a sale of this property will be keenly monitored, including beyond the region. Compared to last year, sales of Southland dairy farms increased this spring, though still on low volumes. Most of those properties that did transact are at the poorer end of the quality scale. Fewer of the region’s sheep and beef properties changed hands than in spring 2016. 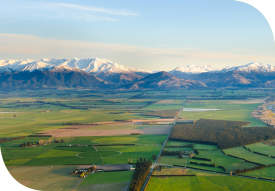 As elsewhere in the country, Southland buyers have plenty of farms to choose from. Through the summer, although existing listings will continue to attract local buyers, interest in the more extensive properties will be more limited due to the greater capital required for properties with such scale. Late spring and early summer Southland listings cover a wide range of dairy farms, plus traditional sheep and beef and deer farms. Featured among the summer listings are a 300 hectare Isla Bank dairy unit, an organic dairy factory, two robotic dairy farms and a quality large-scale Wyndham sheep and beef unit.